When Les Misérables, the longest running musical in history, decides to reinvent itself for its 25th anniversary (of the English musical—the French stage play is 5 years older), it's news; that the reinvention happens to be based on Victor Hugo's own drawings and paintings, it's compelling; that the themes of the story speak directly to our socio-economic and spiritual circumstance, it's a must see. After the defeat of Napoleon at Waterloo, in 1815, the plight of underclasses in France under the restored monarchy (with help from the goldsmiths-turned-financiers, who still control currencies and credit today) was, indeed, miserable, and continued to deteriorate, leading to the rebellion of 1832. The plot of Hugo's book and the musical depict this 17-year period. If anything, producer Cameron Mackintosh's new production is truer to the novel, grittier, and emotionally more gripping that its superb antecedent, which continues to break its own records, night after night in London. Directors Laurence Connor and James Powell have reconceived a number of scenes that connect the musical to the moodiness of the novel through a series of spectacular projections (Fifty-Nine Productions) designed by Matt Kinley, inspired by Hugo's evocative paintings and sketches. The heart of the musical remains its memorable songs and stirring melodies as orginally conceived by Claude-Michel Schönberg (music) and Alain Boublil (book), with lyrics by Herbert Kretzmer, and they were never sung finer than they are from a wonderfully talented and compelling touring cast. 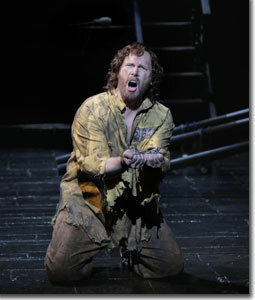 As Jean Valjean, J. Mark McVey shines from the very first instant, when he (as a chained oarsman) laments the many years he has lost as a slave of the state, imprisoned for stealing a loaf of bread for his sister's family. Laws that essentially make it a crime to be poor are rampant today as well, as disenguous as they are—for these laws are made by the very people that have crimped the money supply in the first place, to bring about bankruptcies, foreclosures, and plummeting credit ratings, which allow them to steal the fruits of our labor at fire sale prices. McVey's range, from warm tenor to pure alto, is astounding (highlighted in "Bring Him Home") as are his dramatic talents and emotional appeal, which set the stage for other outstanding performances. Betsy Morgan is luminescent as the lovely Fantine, bringing a prophetic quality to "I Dreamed a Dream," which provides another key spiritual lesson for Valjean. Another hurdle in Valjean's epic quest is, of course, Javert, the police officer. Andrew Varela's subtly layered performance draws the compassion that Hugo intended for this misguided soul, who reads penal intent in nature's order in "Stars"—stirring us with his rich bass-baritone and conviction here and in "Soliloquy," his swan song. The most comic moment of the show is, as always, "Master of the House," by which Richard Vida and Shawna M. Hamic bring down the house with their delightful duet and shameless antics; and we are struck with reverence and inspiration once again with what is now called "The People's Song" ("Do You Hear the People Sing? "), sung by Enjolras (the cutting figure and rousing voice of Jeremy Hays), Marius (the dashing figure and romantic voice of Justin Scott Brown), and the chorus, who are a force unto themselves, doing a fine job of manifesting Les Misérables themselves, within the slightly reduced proscenium that accompanies the tour. Jenny Latimer's poignant work as Cozette unfolds naturally into sweet chemistry with Marius as well as a palpable bond with Valjean. 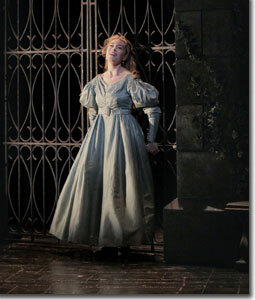 And then there is Éponine (Chasten Harmon) who pins us to our seats with her soaring soprano and clear sense of mission in "On My Own" and other numbers. Excellent work as the boy, Gavroche, on opening night by Colin DePaula. The original orchestrations by John Cameron and new orchestrations by Chris Jahke, with additions by Stephen Metcalfe and Stephen Brooker, are magnificent under the baton of Robert Billig and his 14-piece orchestra. Unlike our own colonists—who prospered with their publicly owned banks until the private British banks compelled Parliament to shut them down, and who later ceded back in Congress (the Charters of the First and Second Banks of the U.S., The National Banking Act of 1863-64, and the Federal Reserve Act of 1913) the financial independence they had so valiantly won on the battlefields of the Revolutionary War and the War of 1812—the intiatives of the French underclasses, students, and other allies in Hugo's historically based story, represent a well-grounded consciousness regarding the persons and institutions that oppress them. Unfortunately, the French flag has come to be used in the same manner as Old Glory, as a means of getting the righteously angry to operate against their class interests and lend support to the same international banking cartel that has turned the world into its debt-slavery plantation and factory. For example, the NATO mercenaries who invaded Libya under the French flag bearing one document—a charter to privatize Libya's central bank, which had been funding African independence. If the spirit of Victor Hugo's story is to live on, then contextualizing it, as we have attempted to do here, is a must. Mackintosh's memorable production will do the rest. Denver Center Attractions' presentation of Cameron Mackintosh's new 25th anniversary production of Boublil & Schöenbert's Les Misérablesruns through September 10th at the Buell Theatre. 303-893-4100 or denvercenter.org.